How IoT became the saviour technology of the century! IoT stands for “Internet of Things.” Breaking down the phrase, we get two words Internet and Things. Internet stands for Interconnection of Networks. It was born in the late 1950s and was known as ARPANET. Experts say that the concept of IoT was taken with the ARPANET but, because of the lack of hardware and software support, it was tough to bring Internet of Things to the real world. Between 2006 and 2008 the first European IoT Conference recognized by EU. In this conference, experts talked about commercializing IoT. Finally, in 2009 CISCO was the first one to connect thing around us to the Internet. Later on, in 2009, companies like IBM and Ericsson also developed IoT solutions for the real world. Smartphones were the first devices that connected people to the Internet even while roaming. This breakthrough came with the launch of the first iPhone. That is the first instance when IoT started impacting our lives. Since, then a wave has begun to flow across the globe to make everything around us, “smart.” The growth of IoT has been exponential since, 2009. How IoT Affects Our Day-to-day Routine? Our day starts at home and ends at home. IoT has reached to our homes and is spreading like wine. Households are getting smarter. Starting from the door from where we enter to the bed we sleep, everything is smart. There are two types of Home Automation, semi-home automation, and complete home automation. Semi-home automation is where devices can do some of the daily tasks for us and have limited access to other gadgets of our home. Total Home Automation is where the gadgets have full access to the house. Devices like Amazon Echo, Apple home pod, and Google home are capable of playing songs according to our mood, booking a cab, setting reminders, providing weather updates, making a call, controlling lighting, etc. and they do it via voice commands only. The gadgets that we use daily are getting smarter as well such as IOT enable smart air conditioner, Fans and monitoring devices like gas meter, water meter, electricity meter, etc. IoT is also prevailing in security solutions for homes and offices. IOT enable Smart smoke detectors, motion sensors and intelligent bio-metrics database are already implemented in homes and offices. The automobile industry has evolved quite a lot when it comes to automation and safety. Automatic Gearing system and electronic parking system have changed the way we drove the car. Some of the examples of how automobile industry is facing change because of IoT are automatic emergency SOS message, automatic service booking, maintenance alerts, automatic fuel sign, Trip analysis, breakdown information, etc. If there is an ideal car having all the specifications mentioned above, then the owner of that car will save a lot of precious time which others cannot. Internet of Things is helping us save the environment by smart gas detectors. These gas detectors are spread across the city which collects data of all kinds of hazardous gases and measures its density in each area of the town. Using this data, we can take the appropriate steps to reduce carbon emission in the city. Smart gas detectors have the capabilities to detect even a small leakage which could destroy an entire city if not fixed in time. IoT has the skills not to improve our lifestyle but also to save lives and towns. More significant the building higher is the maintenance cost. IoT helps to reduce the maintenance cost by suggesting the most effective solutions to maintain a building by measuring its condition time-to-time. IoT can also help reduce the risk of the data security breach at any level. It also protects the structure from fires. Blood Pressure and Diabetes are some of the most dangerous diseases that kill slowly. The risk of such conditions has reduced to a fantastic level as people started using wearable techs such as smartwatches and fitness trackers connected to their smartphones. According to a GFK survey, one in every three people around the world wears a fitness tracking device. Some of the fitness trackers also track the sleep and send the sleep data to their smartphones. The app creates a detailed report using that data which user can access from anywhere provided the internet connection. IoT is making everything around us smart as mentioned. As these things will get smarter, it is going to replace humans in performing all the non-productive tasks hence, improving productivity. The tasks which we would have never imagined to do as humans are going to be accomplished by IoT. Robots connected to the Internet will clean our homes whenever instructed regardless of our situation. With the help of IoT, monitoring will be extremely easy. We will be able to see and control our home from far away via an app. Although, staying away from home, IoT will make us feel as if we are at home. Any vehicle needs maintenance. In our busy lives we might not always get time to provide proper maintenance to it. IoT will help us complete the tedious task. It will send the remainder to car service center for us to send the mechanic and service the car. With the help of GPS we can also track it live on our phones so, no chance of theft. IoT will also benefit at the time of emergencies. The system present in car will automatically detect the type of emergency and ask for the relevant help. No one can deny the Climate change happening around the world. We cannot reduce the global warming but we can surely stop them with the help of IoT. Smart sensors help us collect and organize pollution data according to Country, state, city and area. We already have the ways to reduce pollution all we needed was “data.” IoT not only improves our lifestyle but also save lives. The concept of energy efficient building is prevailing around the world. Such buildings are known as “Green buildings.” IoT can help us save energy that is consumed in big corporate offices and public places. That energy can later on be used at the time of crisis. All kind of wearable tech comes with GPS functionality and smart watches comes with Internet as well. Most of them has a panic button functionality through which we can alert our loved ones at the time of emergency. The heart rate sensor present in the fitness tracker tracks our heart rate 24x7 hence, it gives an alert to the nearest hospitals automatically whenever our heart rate deviates from the normal range. Internet of Things has been impacting our lives since 2009 and is going to impact forever. The only difference will be that the impact will be much more than what it is today. According to the UN projections, world population will rise from 6.8 billion today to 9.1 billion in 2050 that signifies food production has to be raised to feed the one-third more mouths. And, the agriculture industry is accountable for fulfilling humans’ need for food, energy, and shelter (To a great extent). Furthermore, the agriculture industry composes less than 5 percent of the combined GDPs of the world. But, there is one more distressing fact revealed by Bureau of Labor Statistics, employment of agricultural workers is projected to decline 3 percent from 2012 to 2022. Why is this employment supposed to reduce? And, what farm owners or farmers would do to sustain the productivity, increase yield and feed additional 2.3 billion people by 2050. The only solution to all these problems is Agriculture Modernization that has already started by some of the tech-savvy farmers. For the next generation agriculture fields, data collected from sensors would become the fertilizer to grow crops. It’s really perplexing but true. Embracing IoT Solutions would uncover the new ways that tap the full potential of agriculture yield and alleviate all the challenges that hinder the growth of the crop. Before heading to know how IoT can turn out to be a magic bullet for the agriculture, let’s understand what IoT is. 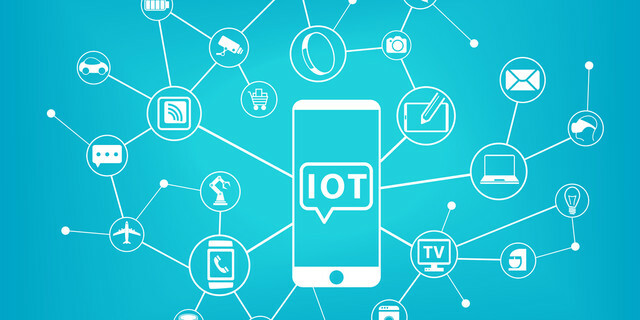 IOT is the technology that extends the limit of internet connectivity from digital devices to physical objects. It enables the communication between digital devices, objects, and other systems. The data collected can be shared between person to person, machines to person or machine to machine, and data is stored and managed at Cloud. With IoT, remote water valves, weather forecasts, pest control, food storage and transportation data, and monitoring system could be connected and information exchanged via sensors is available to the farmer on the mobile phones. Now, take a look how IoT can make agriculture more profitable and crop healthier at every step. Every crop requires different atmospheric conditions and land to grow, but concluding the same is tricky. How could farmers find which land or other conditions are the best fit for their crop? It can be identified by conducting a survey for the agricultural land combining the power of artificial intelligence and IoT in unmanned aerial vehicle (UAV). UAV, a small airplane used for the in-flight observation and monitoring that gathers data like- visual, thermal, and multispectral imagery, air pressure, humidity, the weather condition at resolutions up to 1 cm/pixel. This data is really helpful for the farmers to take the decisive step. Moreover, UAV also helps farmers in knowing plant height, weed detection, plant-counting, crop health and changes in the plant in different seasons. Water supply at the right time, in right quantity and at the right place plays a vital role in the plant’s growth. Water management remotely is also challenging task, especially the management becomes more difficult during the shortage of water, which may otherwise damage the crop. Connecting humidity sensors, water valves and monitoring system, water supply for irrigation can be managed easily. Humidity sensors smartly measure the soil moisture and based on that data, water valves provide water to the field automatically without any human interventions. Also, any leakage in the water pipes can also be identified. The complete data is accessible to the farmers at distance on the mobile. With smart irrigation, there will be the least wastage of water, water consumption in the field can be tracked, in drought areas the crop water management could be done efficiently and unauthorized water consumption (If any) is detectable. Climate and weather influence the crop production at large scale. This dependency on weather and frequent changes in the climate sometimes damage the crops and ultimately farmers suffer from a great loss. How about if the farmer knows weather information before they decide plantation or harvesting of crops. It’d be great. Isn’t it? With IoT farmers would get accurate weather forecast in real-time and based on this information, they can pre-plan the different activities. Also, in case of future contingency, right steps could be taken beforehand to prevent the loss to happen. Despite having right irrigation facility, perfect weather and optimum pest management, plants won’t grow well. Constant performance measurement and evaluation is necessary, but for that regular visit to the field is arduous. Smart technology makes this work done from a distance with sensors. Implanting remote sensors would check the soil temperature, humidity, air temperature, pressure and pretty more! Getting this data, farmer can plan accordingly like- change the harvest time, irrigation time, determine heat events and improve plant health. When plant breeding is done in such a perfect environment, the better would be the food quality and increased production. Presently, getting a good quality food is essential, but having the right level of nutrients is vitally important. Now, farmers can manage the level of nutrients in the produce. Bewildered? As, how is it possible to check, control or manage the level of nutrients in the food. But, yes skyrocketing technology has made it possible. The nutrient analyzers are built where sensors monitor the level of nutrients in the crops. Every sensor relates to a specific ion that would sit on one side of the membrane and when water passes through, these sensors detects the ion presence and its quantity. Simultaneous measurement of six ions can be done in the real-time. The analyzer is synced with mobile phone where all the data is displayed. During plant’s growth, farmers knowing the ion level, they can change the mix of nutrients and improve the plant’s yield. Moreover, changing the proportion of nutrients, color and maturity rate of produce can also be altered. Yes, the healthy crop becomes a prey to pests effortlessly and farmers have to suffer from a great monetary loss. It’s very crucial in the whole crop production cycle to identify when these pests would attack and what quantity of pesticides need to be used. Here pest control sensors would help. The sensors monitor the pest behavior, pest’s population, and analyzes environmental parameters and plant growth. Based on this data the pesticides are automatically sprayed into the field at the place where it requires and in the right amount so that pests are disrupted initially. The complete record of the pest’s attack on the crop, the amount of pesticides sprinkled and how much crop production is affected could be tracked. Implementing IoT reduces pesticide usage in the field and keep crop healthier. Once the crop is harvested, farmer’s work is not done. If you are thinking so, you are mistaken. As, crop storage is an essential part of the crop production process. Employing the correct grain storage techniques includes maintaining the accurate temperature, humidity, air control and pressure in the warehouse. But, getting real-time information is difficult and info received lately would result in the severe damage. Integrating different IoT sensors at storage place would allow farmers to monitor the crop storage in real-time, control the storage temperature, humidity and a lot more. Plus, they would receive the alerts, in case any set parameter in the grain storage changes. Transferring the yield from storage to the market at the correct time through right means of transportation is very crucial. By optimizing the supply chain, farmers can reap good monetary benefits and reduce losses or overhead expenses. With GPS sensors, the owner can easily track where the transport vehicle is and exact its location in the real-time. It helps in monitoring the vehicle and providing help to the vehicle in any emergency. Plus, installing the thermostat sensors in the vehicle would sense the change in the set temperature and if any fluctuation is found, then the owner would be informed. With the potential IoT innovations in the agriculture industry at large scale would certainly bring a global shift in the way farming is done and yields are produced. It is predicted that by 2025, there would be 600 million sensors implanted on 535 million farms worldwide and in 2015, these sensors would grow by three folds by the year 2020. The deployment of the Internet of Things (IoT) has disrupted niche organizations across multiple industries like financial services, technology, agricultural equipment etc. The organizations are shifting from traditional products to smart offerings and outcome-based deliverables. We need to evolve in a similar manner in the industrial world by thinking of the offer from the consumer’s perspective. Efficiently creating and monetizing value shared by IoT solutions will lead us to profitable outcomes. Machina Research expands the scope of its IoT forecasts and highlights a USD 4 trillion revenue opportunity in 2025.
Business models require thinking through the consumption side of the offer (demand side). This explores the demand of the product and its usage. Your customers don’t merely purchase your product. They furthermore look for more opportunities – what they want is what your product can do for them. And hence, it is important to understand the consumer aspects of your offerings. Moreover, the business models also require thinking on the production side of the offer (supply side). This helps you better understand how the IoT product is created and delivered for a symbiotic growth. Let’s further explore various IoT-based business models. This model enables to provide your customers with a physical IoT product and the software. You gradually can upgrade the software by notifying the customers of its cost and it will mirror the results at the consumer-end directly. Let’s take an example of the self-driving cars. The company doesn’t have to additionally provide any product to the users; instead it can continuously improve the car by updating its onboard model and application. The firm can introduce a new feature and update its users by sending a notification. The users will just have to update the system to leverage that feature. You can also use this model to collect data to create information service products to eventually sell with the product-service model. This is a hybrid version of the traditional product business model and the newer service business models. This model enables organizations to offer a physical IoT product along with an informative model. Implementing information service to a product based on its collected data will ensure incremental revenue and provide a competitive advantage. Providing continual information to monetize the availability of the analyzed data that enhance the consumer’s process is the key of this business model. Let’s take an example of ‘connected vehicles’. With the attached Onboard Diagnostic II chip, users will be able to know the temperature, RPM count, pressure, engine load, location of the vehicle, and fuel level. This information-based model revolves around vehicle safety, saving fuel and ultimately, reducing the maintenance cost. This information or data is the key for predictive maintenance that allows the customers to know the health of their vehicles to further avoid any mishap. This is a XAAS – Anything As A Service business model. The company rents a physical product with IoT solution and pays for it only for a period while it is running or working. The service business model is not exclusively related to software or physical products; it can also include the information products. This model allows the organizations to have a predictable and recurring revenue stream by providing their IoT services to the customers for a certain time period. However, your IoT solution must not only have value as a service, but, it must be aligned with how the customer expects to receive, consume and pay for the offering. Let’s take an example of jet engines. The customers that don’t want to own and maintain the engines by themselves lease the IoT-based jet engines from the seller. The seller also provides maintenance by implementing predictive analytics. The customer pays for only the times where the engines were running and producing outcomes for them. In the service-outcome business model, the seller becomes a business partner. There are two aspects of the service-outcome model. The first aspect is similar to the service model but instead of focusing on offering a single solution, there are product lines that are monetized. The other model comprises of monetizing based on the outcome or the performance of the offered solution. The service-outcome business model has an add-on payment based on saving that incentivizes the vendor to improve its customer’s business. The add-on payment in this situation would be related to the reduction in human operating expenses. Let’s take an example of the mining industry. Instead of providing the mining equipment, the company provides IoT solution for the equipment to their customers. And based on the data collected with the use of that IoT solution, the company can further adjust the equipment in accordance with the parameters of the better-performing ones. By adopting the service-outcome business model, both, the buyer and the seller receives an incremental value. This enables them to establish a baseline and generate a percentage of the incremental revenue or incremental savings based on phases or milestones. The final business model comprises of an entire IoT ecosystem. It brings together the producers (vendors) and the consumers (customers) of the IoT technology in order to monetize the solution. Instead of partnering with multiple vendors, the customer becomes part of an ecosystem that delivers the desired outcome. This goes beyond the service-outcome business model where payment now is completely based on performance. This allows the alignment of the business models of the vendors with that of the customers. Let’s take an example of smart farming. The outcome business model focuses on providing a bundled solution for an effective agricultural solution. Instead of providing separate solution for monitoring the moisture level of the soil, the sunlight, and the CO2 emissions, this model offers a set of solution that combines all these in a package. Separately, each of these separate product categories provides value, but when allied, dependencies are organized, creating greater value than the sum of the parts. This enhances the monetization aspect of the solution for the customers as well as the vendors as the payment will take place according to the outcome that each solution provides. The greatest challenge in implementing IoT isn’t technical. The key challenge lies in the business aspect. The challenges are further followed by lack of standardization and strong security. However, these are not the kind of challenges that can’t be addressed and solved by any organization. The key focus should be on using IoT technology to deliver and monetize outcomes. Business issues may be more challenging than technology. Inculcating IoT solutions into your business practice does not mean you must change your business model too. It is equally important to align your sales and distribution goals along with implementing IoT initiatives. You can then continue on the IoT business model continuum as the time progresses. Outcomes effectively revamp industries. They impact the business in a way that enables you to identify your competitors and partners. This reduces competitive risk and prepares you to decide when to spend the time and the resources needed to develop your IoT business and product line. We've updated our IoT platform presentation to tell you more about it, derived products and solutions. The global wireless connectivity market is expanding exponentially, and Bluetooth is heading back to join the IoT pack. Bluetooth 5, one of Internet of Things (IOT) mainstay technology is also set to expand. It all set to cater the growing beacon devices segment. The update will allow for richer information broadcast, speed upgrades, and low energy usage. The low energy feature built specifically for IoT devices will support speed up to two megabits per second which means more building and home coverage. Devices can be connected even if positioned outside. Another interesting feature will be the use Bluetooth powered communication in smart cities, where the usage has been restricted till now. The mesh networking support which is touted to be present in the release can make BLE stronger for usage in tracking assets and waste management. There is a shift from the traditional Bluetooth device and app pairing, as IoT devices move towards the wireless model. Beacons are used to send out rich data collected by smartphones for creating a rich user experience. Bluetooth 5 supports the advertising extensions feature, which provides the continuation of permission based advertising outside regular channels. The Broadcasted data can be received within the Bluetooth device range. Visitor and asset tracking, indoor navigation can be done more easily with the improved Bluetooth features. An example includes shops which announce real-time discounts to offer personalized deals and dynamic content to motivate participation. Bluetooth 5 also claims to reduce interference with other wireless technologies for coexisting in the global IoT environment. Harman IoT services include gateway solutions which capture the data from devices to help business future proof their strategy and create value. As Bluetooth is expected to be featured in over 400 million IoT devices by 2020, the combination will offer a more seamless experience. And will create new opportunities across IoT verticals giving vendors the flexibility to target multiple applications. Overall Bluetooth connections will get faster and more reliable to suit the traffic demands and integrate in IoT deployments, opening doors to huge opportunities.